The job as TSAs is based on passion. 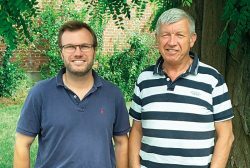 Like Éric in France or Ahmet in Turkey, who share their experience with their sons Georges-Éric and Mustafa, and many of our TSAs do the same job, from father to son. Handing down the profession in a way our TIMAC AGRO community is proud of. It proves that this profession is a pleasure, involving dialogue and commitment that draws in generation upon generation. “I have been working for TIMAC AGRO Avrasya since 2015. My father is a farmer and a TSA, which is how I knew about the efficacy of TIMAC AGRO’s products before joining the company. Today, I am proud to support the farmers: for me, TIMAC AGRO is a byword for quality and reliability. My personal experience is that it is an advantage to work with my father: we are stronger together!” Mustafa Altinisik, Turkey. “I have been working for TIMAC AGRO for over 9 years and I am proud of the technology the company uses. Thanks to the efficacy of the TIMAC AGRO products on plant nutrition, the agricultural yields are increasing. I also take advantage of my son’s energy, and his youth and enthusiasm.” Ahmet Altinisik, Turkey.